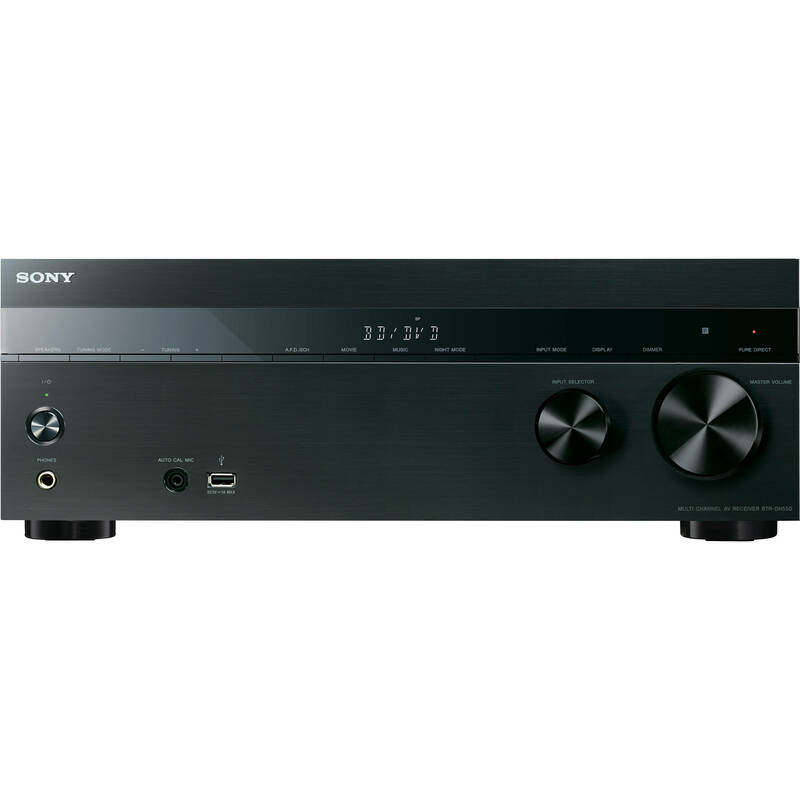 The Sony STR-DH550 5.2-Channel AV Receiver is designed to deliver powerful multi-channel sound. This receiver features 5.2-channel speaker output and delivers up to 145W per channel for robust audio playback. The receiver's front-panel USB allows you to connect additional audio sources like iPhones and iPods, and can also charge compatible devices. There are also two digital optical and a digital coaxial connection available for connecting digital audio sources. A calibration microphone is included for simplified speaker setup. The Sony STR-DH550 is well-equipped for video connections with four HDMI inputs. This model also supports pass-through of 3D and 4K video signals. MHL connectivity allows you interface compatible portable devices like smartphones and tablets for content sharing. Built-in high-resolution audio support allows you to take advantage of dynamic surround sound formats like DTS-HD and Dolby TrueHD. Enjoy versatile HD connectivity with four HDMI inputs (up to 4K capable). Via MHL (Mobile High-Definition Link), easily connect a smartphone and enjoy video clips, music, and more on your connected TV. A front-mounted USB input even allows for easy connectivity and charging of compatible devices. HDMI pass-through functionality allows all connected HDMI devices, including native 4K video content, Blu-ray and Blu-ray 3D movies, video games and other content to conveniently pass-through to your compatible television or projector. Enjoy enhanced home cinema sound via proprietary High-Definition measurement and DSP sound technology. Front Height mode enables vocal height and 3D effects for improved effects positioning and added depth. With ARC, the TV's audio signal can be sent back to your receiver through the same HDMI cable already being used to send audio and video to your TV. Maximize your in-home theater experience with Advanced Digital Cinema Auto Calibration feature. During setup, place the included microphone where you will be seated and wait as the settings are automatically optimized based on the distance and placement of your speakers. Conveniently operate and control select Sony BRAVIA Sync and other HDMI CEC-enabled devices with one remote. iPod Compatibility USB: iPhone 5s, iPhone 5c, iPhone 5, iPhone 4s, iPhone 4, iPhone 3GS, iPhone 3G, iPod touch (2nd through 5th generation), iPod classic, and iPod nano (3rd through 7th generation). Box Dimensions (LxWxH) 19.5 x 15.7 x 9.0"
STR-DH550 5.2-Channel AV Receiver is rated 4.3 out of 5 by 30. Rated 4 out of 5 by L. Jones from Nice sound and nice price. The only issue with this amp for me is that the Pure Direct feature turns off after turning off the amp so you have to enable it each time you turn the amp on. Thought it sounded tinny in the beginning but after some adjustments it does perform nicely. I would definitely use the built-in calibration tool as soon as opening the box. The tool is easy to use and sets it up correctly 99% of the time. I did a side-by-side comparison of setting up the amplifier manually vs. using the calibration tool and the results were essentially the same. Rated 5 out of 5 by Dennis from Great receiver Had a problem with the unit but I did not know what I was doing I ran the surround rear speakers thru a wireless rear speaker controller. this is where the problems started. Rewired the unit direct to the speakers and this receiver sounds great. Just like watching a video in a theater. I am using 2 pair of Yahama 6490 bookshelf speakers, a Pioneer center speaker with 7 inch speakers and a Sony 100 watt powered subwoofer. I am so happy that I purchase a new SUHD television so I can have the total experience. My first movie after I got the Television connected to the receiver and blue ray player was The Wall. I am truly at my home theater. Will buy again. Rated 5 out of 5 by The Editor from Evan Better Sound The Sony STR-DH550 5.2 channel AV Receiver is an outstanding piece of equipment. I have a 92 inch HDTV and use Bose cube speakers with out the bass module. I have a 15 inch subwoofer with a 500 watt amp and a 10 inch sub with a 250 watt amp. Being able to utilize both subs using the dual subwoofer connection changes the entire sound spectrum affording the sub bass and mid bass rounding out the way the movie producers and television engineers intended the sound track to be heard. The connection of the Sony STR-DH550 was very clear and precise in the instruction manual obtained online. Being able to see the receivers menu on the TV screen makes setup easy and the auto speaker adjustment via the enclosed speaker setup microphone made the setup super easy.The Sony STR-DH550 for the 5.2 speaker setup and the Sony STR-DH750 for the 7.2 setup are both superb AV Receivers and well worth the investment. Rated 5 out of 5 by Anonymous from Works Great for my Application I used HDMI Imput & Output so pretty much plug & play.The auto speaker setup made speaker setup easy. Rated 5 out of 5 by johnmcevoyphoto from POWERFUL Simple set-up and operation. Connected easily with HDMI to smart TV and blends features of both seamlessly. Rated 5 out of 5 by Steven W. from Great AVR Plenty of inputs and outputs, but missing a simple RCA audio output -- have to use the HP jack for that. Speaker posts are close together, but workable. Easy to operate from the front or the remote. AM ant. connect is a inline pin connector which may not be available on your powered ant. I have a Sony sawm200 active subwoofer connected.4 JBL floor speakers..12 inch woofers 6 inch mid. 3 inch tweeters..an EV s 60 studio monitor for my center channel. All sounds absolutely awesome..except the subwoofer...it's working but I'm not getting much volume from it..have to stand next to it and listen close to even know it's connected. What do I need to do? I if anything, are my floor JBL speakers taking away the bottom end..? Or is something wrong.? Make sure the sub is connected via a dedicated subwoofer cable and the connections are secure. If the sub has a built-in volume controller, make sure it is turned up. Your JBL floor speakers should not have an effect on the sub at all. You may want to re-calibrate the system as well. If you connect a subwoofer with an auto standby function, turn off this function when watching movies. If the auto standby function is turned on, it switches to standby mode automatically based on the level of the input signal to the subwoofer, and the sound may not be output. i have onkyo speakers will this receiver work with them? Most speakers may be used if they are between 6-16 ohm impedance. Check this spec on your speakers before connecting. A lower impedance speaker can damage the receiver and/or the speakers. does it have Bass and treble controls? You may connect via the front USB port. found the problem. had a Wireless amp turned up all the and when I adjusted it the volume became lower than the front speakers. So if you get a Wireless device for rear speakers get the one that is low in amp power, and you front speakers will work fine. Now mine do. For the time being, I am using the Sony STR-DH550 as a HiFi receiver (not surround sound). All the input sources are standard stereo. I have my B set of speakers plugged into the Surround speakers output, but I have not figured out how to make them work. Is this even possible? Any advice? Thanks. The good news is, this IS designed to work this way, just not the way you're doing it now. There's a mode called multistereo that basically replicates right and left main to right and left surround. Leave wired the way you have it now and just select multistereo and you're done. I have this and a Sony 850D (65 ). Should I place all my HDMI connections into the receiver, then the ARC one shared with TV, or.. Should I hook all my HDMI devices into the TV, and just the ARC one to the receiver? Asked by: Bart & Heather D.
I followed the Sony rep's advice to plug everything in the receiver. Seems to have worked. At first, I had a sudden reduction of resolution through my DISH box (blurry and smaller screen), but when I turned off my box and restarted it, it came back to full resolution. I have other questions using it with my TV, but I'll ask that separately. Answered by: Bart & Heather D.